We have now moved into the second month of the Occupy Wall Street protests and the movement has not only taken hold in towns and cities throughout the country but spreading around the world. Chile, is one country where for the past five months, students, teachers, school administrators and their supporters have taken to the streets of Santiago protesting the high cost of education. The Occupy Wall Street protesters have been and continue to be criticized for their lack of a simple concise message. We’ve become so indoctrinated with sound bites, distilled mash-ups of easy to digest ideas that we expect the same from hundreds of thousands of leaderless self-motivated individuals who are pouring into the streets dissatisfied with a myriad of social, economic and political issues. One message that is clear to my eyes and ears is the current state of U.S. education and the student loan debt crisis. And one thing that the protesters in Chile and those in the Occupy Wall Street have in common is that a large number of those protesting are students or recently graduated college students facing a bleak employment market while saddled with unforgiveable student loans with high interest rates. 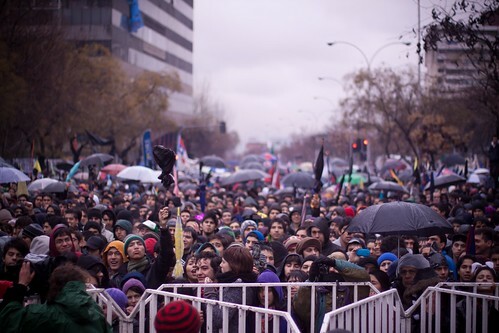 The goal of the student protesters and their supporters in Chile is to transform their country’s education system. They are seeking a referendum to significantly increase the funding and quality of public schools which they claim have been on the decline. In fact, they demand education to be 100% public. Most of the better public schools in Chile are charter schools and students still have to pay to attend such schools. And just like their US counterparts, the Chilean students are often in debt for years after graduating from university. There is no question that our educational system too is in crisis. State institutions have cut back on course offerings as well as teaching and administrative staff. Our schools are failing.. In the words of Mark Twain: “Every time you stop a school, you’ll have to build a jail.” If we want our children to succeed we need to provide them with an educational system that is rich in resources and infrastructure with trained personnel. But that is not what is happening. More and more public schools are closing down or becoming fee-based charter schools. Those that continue to operate face overpopulated classrooms, are understaffed with teachers and administrators preoccupied with the “No Child Left Behind Act” testing mania instead of concentrating on the actual act of teaching and learning. With revenues generated from property taxes on the decline because of high foreclosures, we can safely conclude that more local schools will feel the affect of the financial downturn. Why is it that when our elected officials are faced with a budget crisis they immediately roll up their sleeves, sharpen their scalpels and unabashedly cut, slice and saw away at our public education system? Why is there this vitriol directed at publicly funded institutions which can serve our student population just as affectively as private institutions? Why do we have a system in place that is set up to drive its student population into debt the very day they enter their classroom as a college freshman?